Join the king of the Greek gods high atop Mount Olympus in Ancient Fortunes: Zeus. This 5 reel, 10 payline video slot has been created by Microgaming and is played using Rolling Reels where successive wins increase multiplier prizes. Get on a roll with the Rolling Reel wins during the Free Spins feature and payouts can rocket by up to 21x. Play this medium volatility game on your PC, tablet or mobile from between 10p and £70 per spin. There’s a nice classical feel to the design here. You’ll see swirling clouds in the background and a brick construction which houses the reels. All of the symbols relate to the ancient theme. You’ll see carved animal head symbols as well as a selection of deities from the ancient world. The God of War, Ares, is the most lucrative symbol, delivering 62.5 times your bet if you land 5 in a row. The game engine here uses the Rolling Reels feature – winning combinations can start from the left and right most reels too. After a winner hits, the successful symbols are removed and new ones drop in and replace them. This process keeps on coming as long as a new winning combination is created. Get on a run with the Rolling Reel combinations and you’ll see your payout boosted by a multiplier. Depending on how many wins in a row you manage, you could see your payout boosted by 2x, 3x or 7x is you land 3 or more consecutive wins. The multiplier reverts to 1x following a winless spin. 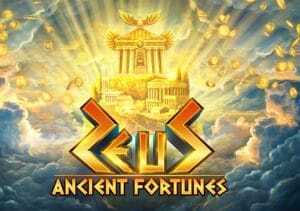 Ancient Fortunes: Zeus also comes with a Free Spins feature – landing 3, 4 or 5 free spin scatters awards 10, 15 or 20 free spins. The Rolling Reels are active during these feature too, generating even bigger potential multipliers than in the base game. Get on a hot streak here and payout can rocket by 3x, 7x, 11x or even 21x. Landing 3 or more scatters results in a retrigger and another round of free spins – there’s up to 50 extra free spins to be won taking your potential total to 70. Microgaming has taken a tried and trusted theme and combined it with some ever-popular features. The result is a pretty good video slot which looks and sounds excellent and delivers plenty of action. The variance here is in the medium range with wins of up to 1,399.3 times your total bet on every free spin. We’ve taken plenty of trips back in time to classical era Greece. This doesn’t offer anything especially earth shattering. It’s all very tidily done though, both in terms of design and playability. If you like donning the virtual toga, then Ancient Fortunes: Zeus should be a hit. I also suggest you try NetEnt’s Gonzo’s Quest where consecutive wins in the Free Falls Bonus feature will result in a 15x multiplier where can lead to payouts of 1,875 times your bet on each free spin.